Imagine yourself at a fine restaurant, the kind of restaurant with soft candle-light and white table cloths; served by waiters in tuxedos who cater to your every whim. Your favorite dish is on the menu and the chef prepares it to perfection. But, as you sit soaking up the atmosphere you get a whiff of a very unpleasant, nauseating stench, and as you gaze around the dinning room you notice that all the tables have what appears to be vomit all over the pretty white tablecloths. And your worst fears are confirmed—to your horror, just as your waiter serves you your dish, he suddenly vomits on your table too! Surely, no person could avoid become revolted by such a disgusting experience. The question naturally comes to mind in connection with the verse above: Is it the “table of the demons” that are full of filthy vomit?No, it is understood that Satan’s table is not spiritually healthful. It is not reasonable that God would be at all concerned with what is presented on the “table of the demons.” Jehovah is only concerned with his own table, which, according to the context of Isaiah, has become defiled because the priests ministering to those at Jehovah’s table are themselves spiritually inebriated, which evidently is the source of the “filthy vomit.” Keep in mind, too, that there is a slave appointed to feed the household of God. Does that necessarily mean, though, that all that is served is healthful? If that is the case why then did Christ make it clear in his illustration that the appointed slaves will be judged as to their faithfulness in carrying out their assignment when the master arrives? Malachi would seem to contradict the suggestion that it is Jehovah’s table that is polluted with vomit, since in Malachi it seems Jehovah’s priests are only saying that God’s table is polluted. We may be sure that Jehovah’s table is holy, because Jehovah is holy and the Bible is holy. The truth is holy. But, the table itself may become defiled if those entrusted to minister at the table are in any way unappreciative or negligent in their duties—or even spiritually intoxicated. (Interestingly, the evil slave is condemned for beating his fellow slaves and for associating with drunkards.) So it is, then, the tables in the house of Jehovah that have become unclean. Nevertheless, it is still the table of Jehovah and Jehovah’s truth should not be despised. That being the case, as an example of the sort of vomitous teachings the prophecy of Isaiah may be illustrating, consider the Watchtower Society’s regurgitations on the 1914 doctrine. Because millions of Jehovah’s Witnesses unquestioningly accept the 1914 invisible parousia teaching at face value, it is important to hold the Watchtower’s method of reasoning up to close critical scrutiny. 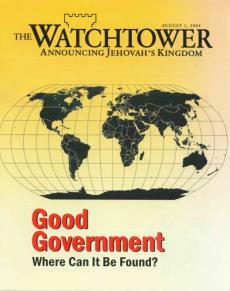 The August 1st, 2004, Watchtower carries a typical feature article entitled: “Good Government, Where Can It Be Found?” The article briefly makes the case for world government and then asserts that world government has already become a reality since 1914 in the form of God’s kingdom. Did you catch the Bethel’s legerdemain? Surely, clear-thinking persons realize that there can only beone instance of extraordinary circumstances when all the nations will mass together as one to war against God; yet, the Watchtower now applies the prophetic Psalm to 1914 and also to a future crisis. But, if 1914 was the fulfillment, then that’s that—why expect another fulfillment? The reason the Watchtower continues to teach that the Psalm was fulfilled in 1914 is because the nations’ massing together is in response to Jehovah installing his King. But, if the Watchtower were to admit that the circumstances of World War One were not really the true fulfillment of the prophetic Psalm, it would mean a repudiation of the entire 1914 doctrine. No doubt they recognize that to do so would be faith shattering for a very large percentage of Jehovah’s Witnesses and would result in a humiliating loss of face for the Watchtower Society. But, since it is obvious that Jehovah has not disturbed the world’s high officials in his hot displeasure for their banding together against him and his Son, the Watchtower is impelled by reality to point to a future fulfillment too. The Watchtower then offers as proof that Christ invisibly returned in 1914 the fact that the Jehovah’s Witnesses organize various disaster relief efforts around the world. (As if Jehovah’s Witnesses were the only religious organization that conducts such operations.) The article references the 11th chapter of Acts, where we read that the early disciples organized a relief campaign for the brothers in famine-stricken Jerusalem. Apparently, though, the Watchtower’s writers do not even realize that the account in Acts actually negates their claim that the kingdom is now ruling. How so? Well, obviously Christ’s Kingdom was not operational then, at least not as Jehovah’s Witnesses suppose it is now, and yet the disciples accomplished what the Watchtower offers as evidence “the kingdom government is now operational.” In spite of such specious reasoning, the concluding paragraph of the article gushes: “Evidence is overwhelming that God’s Kingdom is a reality in full operation.”In reality, the Watchtower demonstrates that its spiritual tables are covered with the filthy vomit of untruth and error. Jehovah’s Witnesses, of course, regard the Watchtower Society as Jehovah’s “chosen channel of communication.”So, it is naturally assumed that only the Watchtower can reveal to our minds the “details regarding the outworking of [God’s] purpose.”However, the evidence is daily mounting that the leading brothers of the Watchtower are the ones who are determined to stubbornly cling to human interpretations of prophecy that should have been discarded long ago. For example, for decades the Watchtower has taught that Jehovah’s Witnesses are residing in a spiritual paradise. But, if that were really true, why are Jehovah’s Witnesses still plagued by the presence of animalistic people even though the prophecies depicting spiritual paradise distinctly say that not even one foolish or animalistic individual will pose a menacing presence there? As an example of trouble in spiritual paradise, (2004) a Jehovah’s Witness and father in North Carolina apparently killed his entire family—slitting the throats of his own daughters—whom he allegedly had also sexually abused. (The news article is no longer available online) Presumably right up until his own death the pedophilic Jehovah’s Witness was standing shoulder-to-shoulder in “spiritual paradise” with the brothers and sisters of his local congregation. In spite of being aware of these sorts of horrific crimes taking place in the organization, the Watchtower still falsely credits God for ushering Jehovah’s Witnesses into a predator-free spiritual paradise. If “Jehovah has revealed to humble ones details regarding the outworking of his purpose through his chosen channel of communication,”then we would expect the Watchtower to be a beacon of spiritual light as regards the prophecies. In reality, the Watchtower has misunderstood and distorted virtually every prophetic book in the Bible. Have Jehovah’s Witnesses really devoured Christendom’s once-fertile fields? – more vomit. Consider a number of examples: The prophecy of Joel foretells of a symbolic army of locusts and other sorts of creeping insects that will devastate the earth as an immediate prelude to Armageddon. Even though the prophecy of Joel clearly indicates that Jehovah will rescue his people from the ravages of the locust-like military force, nevertheless, for the last 70 years the Watchtower has taught that the locusts represent Jehovah’s Witnesses! There seems to be no earthly power that can disabuse them of their error. Jehovah’s chosen channel has certainly not been privy to this aspect of “the details regarding the outworking of his purpose,” as Bethel boasts. The Watchtower’s ill-conceived commentary on Habakkuk would have Jehovah’s Witnesses believe that God assigned the Nazis, Communists and various democratic nations “for a judgment.”That would mean, for example, that Jehovah authorized the Nazi Holocaust! It seems to be impossible for them to grasp the fact that the vision of Habakkuk has to do with a global genocidal holocaust—a great tribulation—the likes of which the world has never before experienced. Again, what justification is there for the Watchtower to boast of enlightening Jehovah’s humble servants as regards the details of the outworking of God’s grand purpose? By far, though, the Watchtower’s most grievous error in prophetic interpretation is the misleading notion that God has already judged his own house and that all future judgments will be directed at Christendom and the world. Indeed, it is the erroneous assumption that the Master has already arrived and appointed his faithful slave over all of his belongings that is the underlying doctrinal basis for the Watchtower’s frequent boasts of being Jehovah’s chosen channel of communication. (At the 2010 annual meeting one speaker boasted that when they all members agree the Governing Body of Jehovah’s Witnesses is very close to being Christ himself! Surely, this is evidence of the sort of spiritual intoxication described in prophecy.